Bri Ribaj: Free Bikes on Campus? I feel strongly about bikes. In my case, the bike represents not only an active and serious hobby but a way of life. On the average, I cover about 50 miles a week which is much more during warmer seasons. I believe in notions like 'agito ergo sum' and being on my Cannondale brings that very thing to fruition. However, I find many examples from my quotidian routes of drivers who seem to have a hard time with the idea of bikers safely riding on the lanes. Biking and bikers are featured on driving manuals and, based on that bit alone, I assumed that people would be aware of the biking breed and respectfully acknowledge them on the road. Alas, this is not the case all the time. I have biked in different countries and US states and I find that there where biking is used more by people be it recreationally or transportationally, it is safer to ride. But drivers are not the only ones at fault. Many bikers seem to forget to abide by traffic rules as well. Hand signals are not always used and the red light is seen as optional. So, drivers and bikers, safe traffic goes both ways. While driving I have caught myself making comments like: "Grh [insert eye-rolling], where did you learn how to ride?! It's a LEFT turn, Armstrong!" And as a rider I often think: "Oy! Driver's manual and the law says I need to be on the road not on the sidewalk!" "When Kylie Galliani started at the University of New England in August, she was given a key to her dorm, a class schedule and something more unusual: a $480 bicycle. 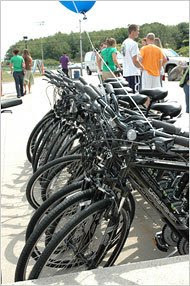 Bicycles to be given to freshmen at the University of New England in Biddeford, Me. The University of New England bikes are personalized. Free or subsidized bike programs at colleges have had mixed success. University administrators and students nationwide are increasingly feeling that way too. The University of New England and Ripon College in Wisconsin are giving free bikes to freshmen who promise to leave their cars at home. Other colleges are setting up free bike sharing or rental programs, and some universities are partnering with bike shops to offer discounts on purchases. The goal, college and university officials said, is to ease critical shortages of parking and to change the car culture that clogs campus roadways and erodes the community feel that comes with walking or biking around campus." That's a pretty cool program. I bet with time it will really help much with the car/parking cost issues and such. Plus, it's green, green, green. Just make sure you don't get doored on that street of yours. Even though, I somehow know it's nigh impossible for that to happen as I have seen you behind the wheel and on the bike :)). The campus story on the Times is amazing! I hope it'll spread faster. that program is pretty cool. denton, texas was experimenting with free community bicycles all painted green and maintained by a group of bike enthusiasts. i wonder how that's going. I would love for sth like this to happen in my town... Community organizers can perhaps make sth like this happen, eh? What a great program. I love riding around town on my bike, but I try to take streets with low traffic or designated bike lanes, because I don't trust my safety to the clueless drivers out there. But also as a driver I have witnessed plenty of cyclists doing stupid things. One thing that bugs me is when they insist upon balancing on their bikes at a stoplight and end up swerving in front of cars also stopped at the light. I wish they'd just put their foot down. I also can't understand cyclists who talk on their cell while riding. I don't even know how they do that. And I laugh when I see someone smoking while riding a bike. Bizarre.